"Use this scratch recipe to make zesty cranberry muffins with a slight citrus accent via orange zest and orange juice." Preheat oven to 400 degrees F (200 degrees C). Grease and flour muffin pan, or use paper liners. Beat oil and sugar together until light. Add egg and beat until smooth. Add orange juice and grated zest. Add flour mixture and stir just until mixed. Fold in cranberries. 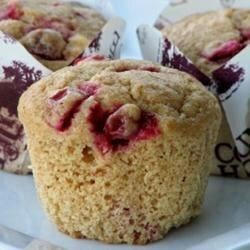 Great muffins! The OJ is the perfect balance for the tartness of the cranberries. I'd like to try the recipe using whole wheat flour next time. Perfect for brunch day after T-Day. I doubled the sugar based on what I read from other reviews. It was enough, but the flavor is still just okay. I only used half the amount of cranberries too. Probably won't make these again. These are absolutely delicious! I also added 1/2 cup finely chopped nuts, and baked them in Jumbo muffin tins. Made 6. 1/4 C. Sugar should have been the give away that these were T-A-R-T with a bitter aftertaste!!! Too bad, since they were a cinch to prep & baked very nicely.